Mosaics have long been my favorite art. There’s just something so beautiful about pieces that are done in mosaic; from the intricate and unique designs to the colors. I just can’t get enough. So I thought I would share some beautiful mosaic ideas that you can incorporate throughout your home and garden. The great thing about mosaics is you can do them with just about any broken glass – or even CDs and other items. Whether you want to do a more traditional mosaic with tiles or you have some broken china that you want to put to good use, there are a number of ways that you can dress up old furniture and create new pieces to adorn your home or garden. 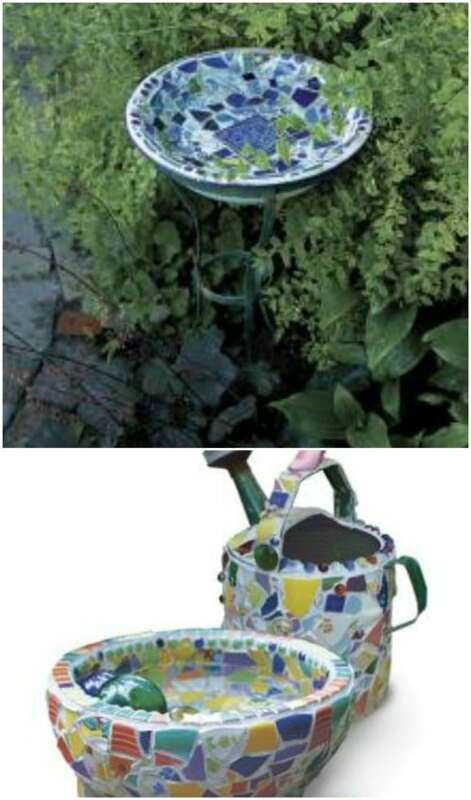 From beautiful garden chairs to raised flower beds and even a great birdhouse, you’ll find something that you can turn into a beautiful mosaic piece of art and many of these projects use repurposed items. You know how much I love repurposing, especially when it takes broken things and makes them new again. 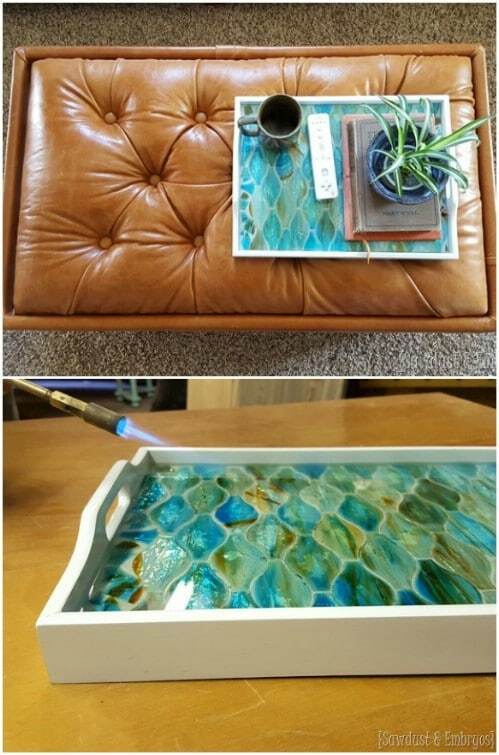 Just check out these amazing ways that you can repurpose broken glass. When I say that there are multiple things you can do with mosaics, that’s exactly what I mean. There are so many wonderful ideas in here for everything from a mosaic tabletop for the kitchen to one for the outdoor patio, and there’s even a great bedside table project, too. I love redoing tabletops especially and giving them a new look. Just take a look at this colorful table that’s redone using bottle caps. Once you get into the trash to treasure outlook, there’s nothing that you can’t DIY! So, if you’re looking for a great way to add beautiful mosaics to your home interior or to your garden decorations, this is definitely the project list for you. We’ll look at how to create a beautiful backsplash for the kitchen with broken mason jars and even a wonderful garden ladybug from mosaics. There is definitely going to be a project on this list that wows you and I can’t wait to hear which ones you have tried! 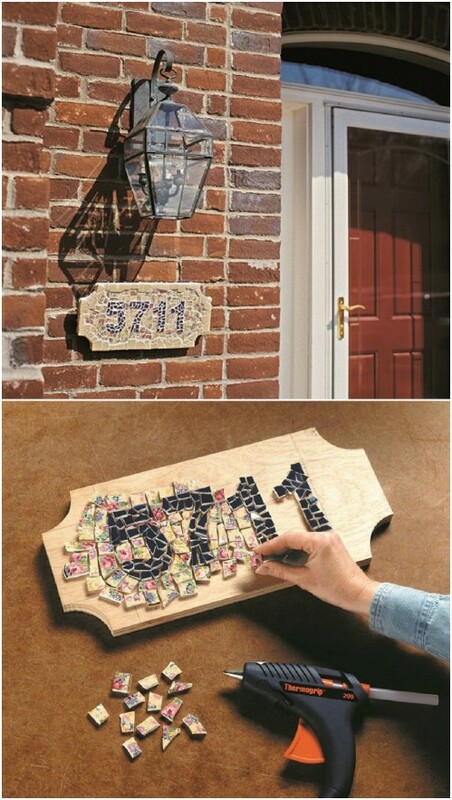 You can instantly improve the look of your entryway and get a great address marker at the same time with this mosaic project. It’s pretty easy and will definitely improve your curb appeal. You can use tiles, broken dishes, or just about any other glass to create it. Turn your kitchen into the most beautiful room in the house when you add this backsplash that is made with the mosaic concept. You can buy tiles in different sizes to create this effect or make your own tiles from broken china and other glassware. I love the mosaic look in the kitchen and this backsplash is definitely worth the effort. Imagine turning a chair and some broken glass or tiles into a lovely bedside table. You can do this DIY project in less than a day and it will give you the most unique and most beautiful nightstand imaginable. 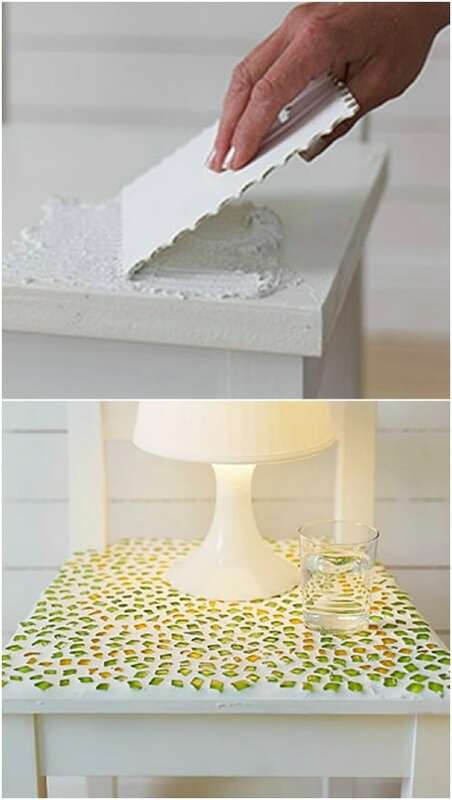 You can also use glass stones or similar items to make it and it’s a really easy way to get a nice bedside table. 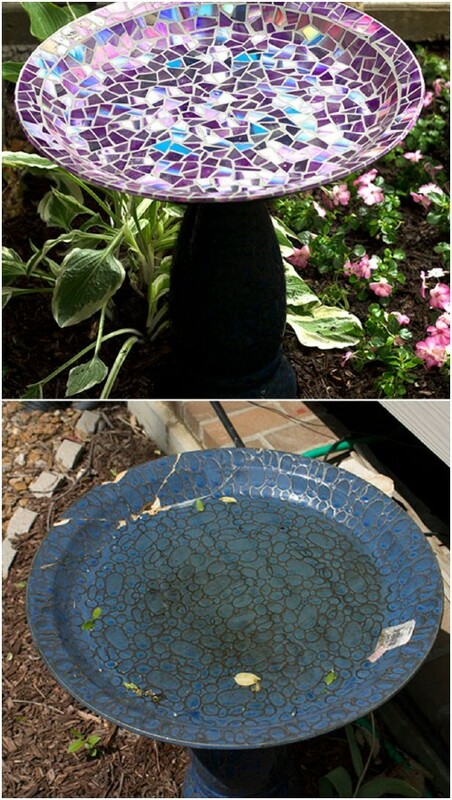 Turn those old useless CDs into a great birdbath. You just break down the CDs and then put them together mosaic style to create this lovely birdbath. You don’t even need an existing birdbath to cover. You can make one from a large plate or shallow bowl and something sturdy for the base. Turn broken glass or small tiles into a beautiful house for your feathery friends. 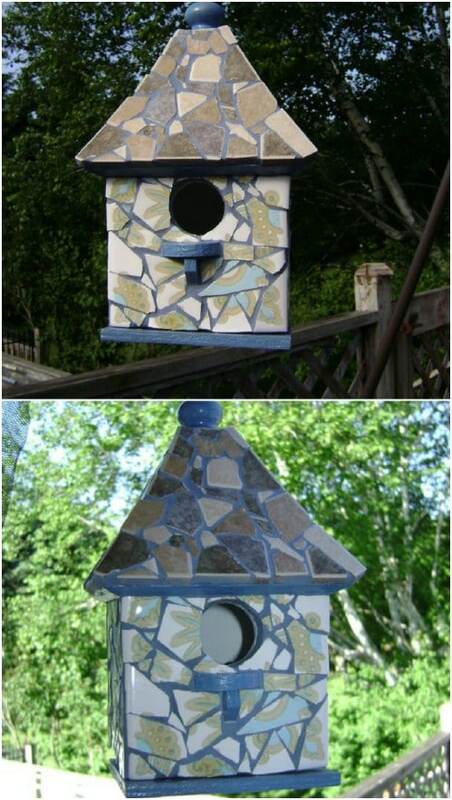 You just build the mosaic look over an existing birdhouse, which you can pick up at Walmart or any home improvement store for around $10 or less. Or, if you want to be really crafty, you can build the wooden birdhouse yourself and then add your mosaics. Build a beautiful display for the front porch from some terra cotta pots and broken pieces of glass. You could also use glass stones or small tiles for this project. I love the idea of doing several of these to decorate the porch and give it a great themed look. You can also set them around the house or hang them from the deck. 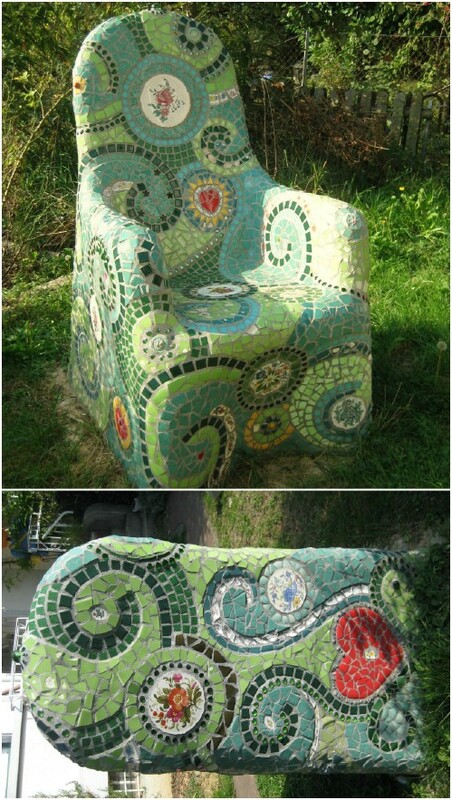 Now this project is a bit complicated and time consuming but oh my goodness, how great is this mosaic garden chair? I love the entire look of this and even though it may take some time to create, it would definitely be worth it to walk outside and see this on your patio. 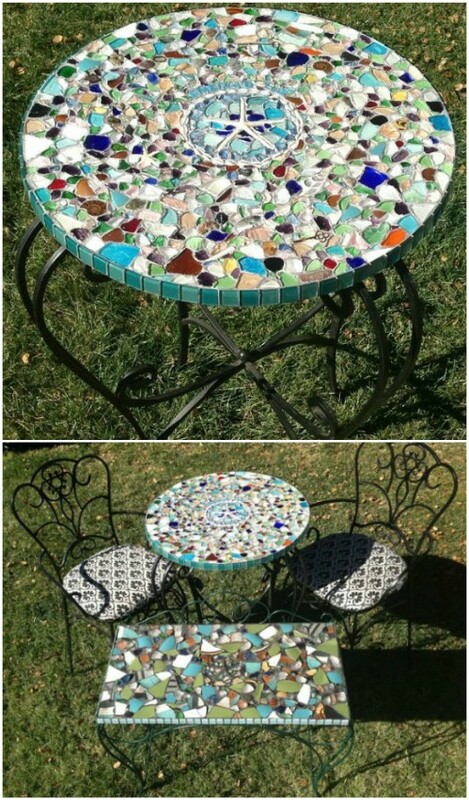 I love the thought of sitting in a mosaic chair in the garden and even having a little mosaic side table to sit my ice tea on. I adore the idea of building this raised garden bed with cinder blocks. Not that I have never built a raised cinder block garden, but I have certainly never decorated it with mosaics. I love this for flower beds or you could even do a small vegetable garden if you want it to be really fancy. 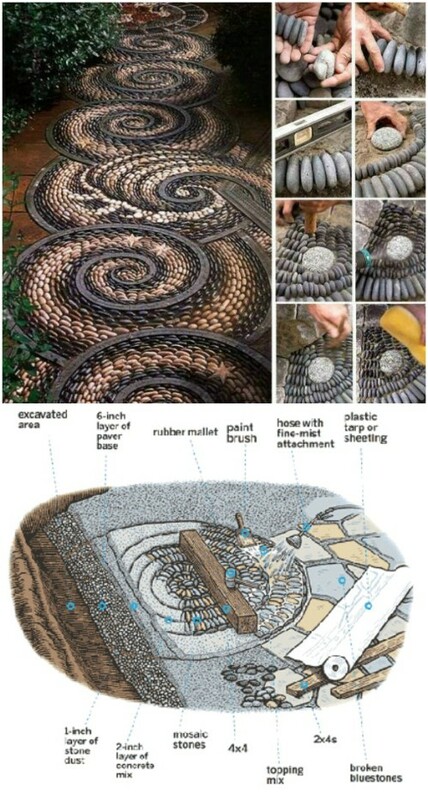 Just build your raised bed and then add your mosaic decorations. Not only are these cocktail coasters beautiful and really easy to make, they’re made with upcycled jar lids so you get to turn trash to treasure with this one. The mosaic is really easy to do and when it’s finished, you have a set of beautiful coasters that didn’t cost anything – depending of course on what supplies you have on hand. These would make excellent gifts! These little lady bugs are really easy to make and would be the perfect decoration for your garden area. You make the entire thing yourself and then add the mosaic for character. I love these and can imagine that you could create all sorts of little garden creatures like frogs and other bugs if you wanted. The lady bugs may just be my favorite, though. I love gazing balls! Seriously, I would have these things all over my yard if I could. That said, I also really love this DIY version that uses mosaics to create a stunning look and it’s something that is really easy to put together. You can make several small versions of a gazing ball using Christmas ornaments or go larger with a bowling ball or something similar in size. 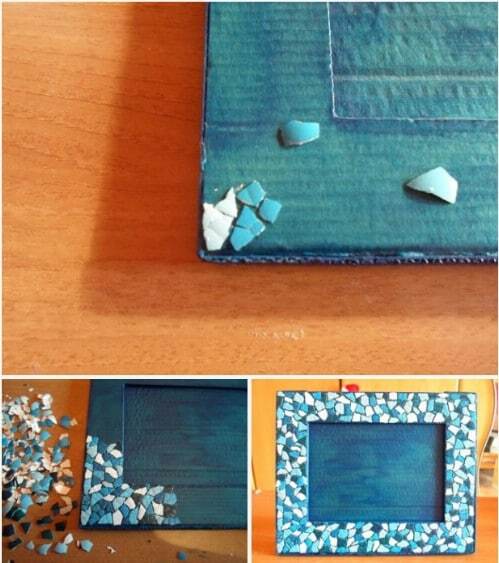 This eggshell mosaic picture frame is actually made with eggshells! I love the thought of upcycling eggshells into something so lovely and you don’t need a frame either. You make this with cardboard and then cover it with your colored eggshells. To get the look, you just paint dry eggshells in whatever shades you want with acrylic paint. Once the pain has dried, just crack the shells into small pieces and create your design. 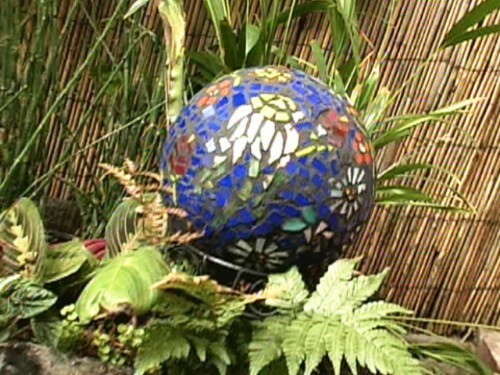 Turn all sorts of things into beautiful art for your garden using mosaics. From watering cans to plain bowls or even upcycled tuna cans, you can just cover those items in mosaic and use them to dress up your flower garden. You can use larger items as mosaic planters and create an entire art gallery of your mosaics out on the patio or in the garden. 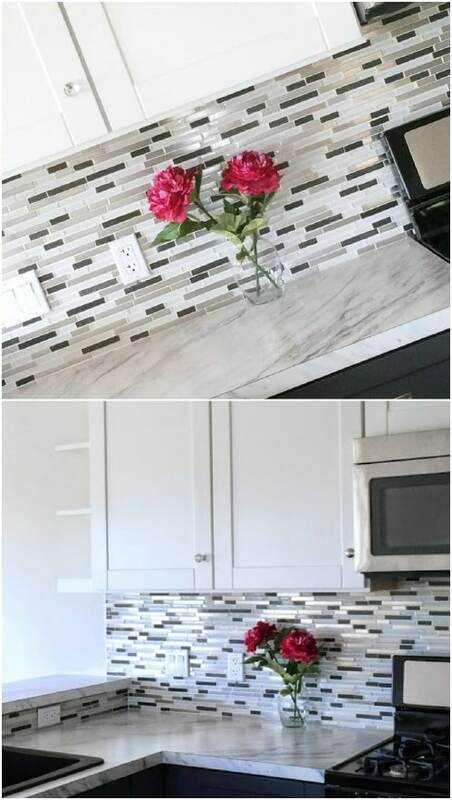 Here’s another beautiful backsplash that has been created using the mosaic technique. This one however, is made from broken mason jars, or any old jars that you may have on hand. Talk about turning trash into treasure! This would be so beautiful in the bathroom or you could do it in the kitchen as well. What a wonderful way to upcycle empty food jars and turn them into something spectacular! Turn an ordinary mason jar – or any empty jar for that matter – into a beautiful display for flowers or anything else when you add mosaics. 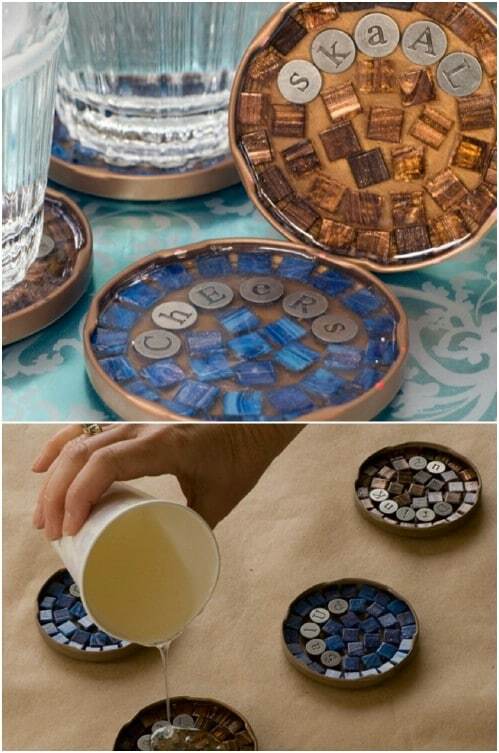 You just use a strong adhesive to glue your mosaic glass pieces onto the jars. When they are dry, they make beautiful candles. Just add a tealight or taper candle, depending on the size of your jar, and you’ll get a nice glow around those mosaic pieces. 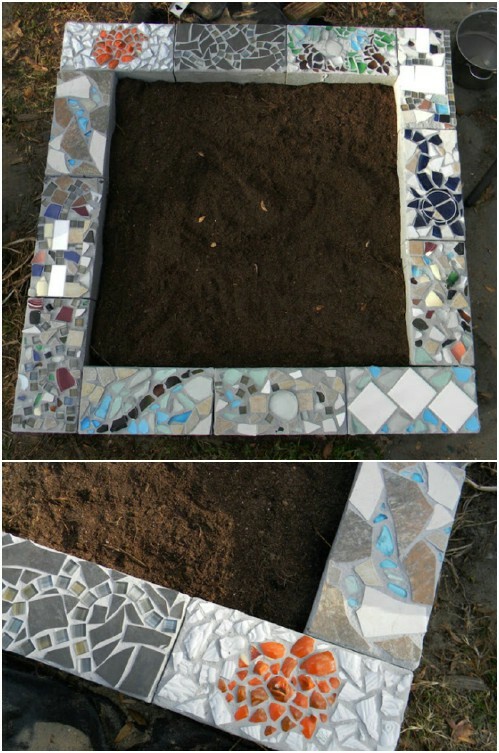 Turn an ordinary, boring mirror into a work of art when you add mosaics. I just love this flowered frame and it’s really easy to create. You’ll want to choose a mirror that has a base sturdy enough to support your tiles and grout. However you choose to design it, turning a regular mirror into a mosaic framed mirror is a beautiful idea. This may actually be my favorite project on this list. 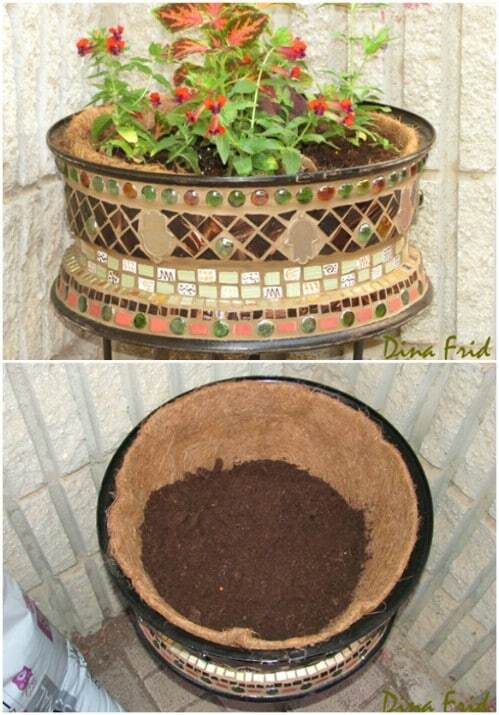 It’s an old wheel with mosaics applied to turn it into the most gorgeous flower pot ever. Imagine having this on your porch or patio! I love repurposing projects and I absolutely adore how this looks when it’s finished. You can use tiles, broken china, or glass stones or a combination of the three to create the look that you want. 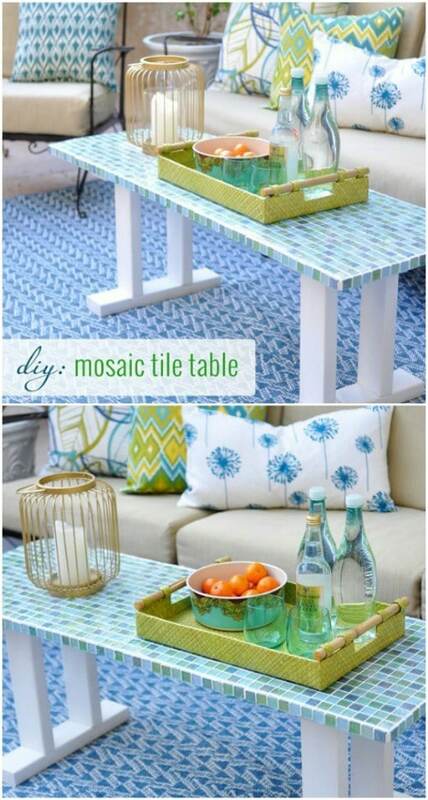 Turn your regular patio table into a beautiful mosaic topped table! You can use your existing patio table or repurpose an old coffee table if you don’t have a patio table. Just paint and then add tiles to the top to create the mosaic look. In this particular case, you can actually build the table from scratch using left over boards from other projects and then create your mosaic design on top. but it will well be worth the effort when you see the finished product. It’s a beautiful garden path that is sure to instantly improve your garden view as well as your curb appeal and home value. I’ve never really been a fan of plastic pink flamingos, but I do love this mosaic one. You make it from those old Dollar Store plastic flamingos that cost only a few dollars each. If you already have a few of those on hand, you’re halfway there. Just add your mosaic tiles or broken glass to give your flamingos a great new look. 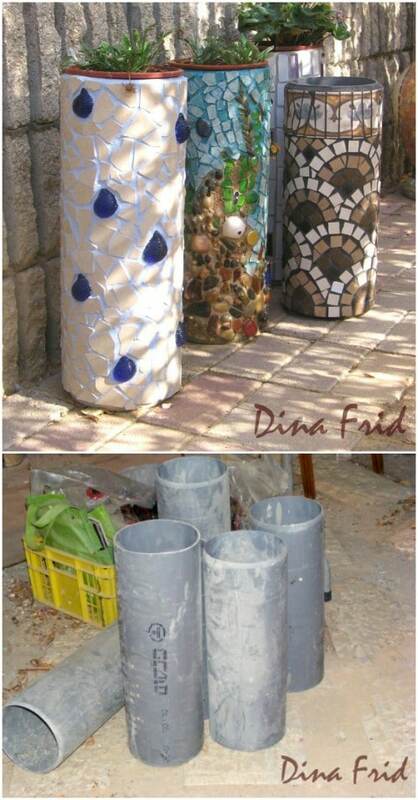 A large PVC pipe can be upcycled into a beautiful flower pot when you add mosaics. These are great for sitting on the porch or patio and you can use any number of things to create your mosaic design from tiles and broken glass to glass stones and even rocks. They make beautiful planters when they’re finished and are sure to give you a great updated look for the walkway or patio. 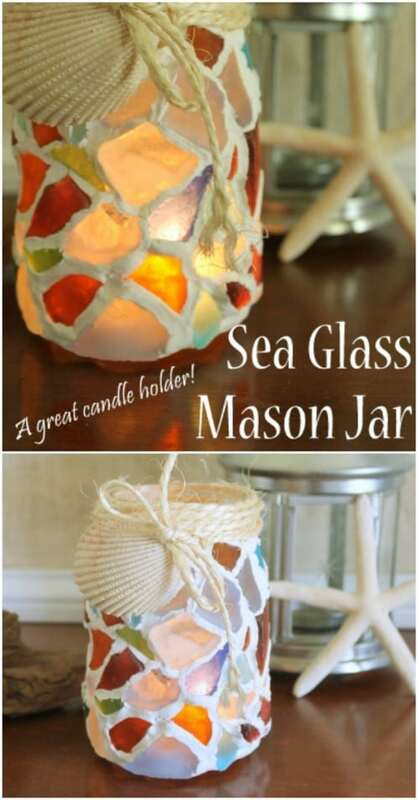 Ordinary mason jars themselves are great but when you add this sea glass look, they become even better. 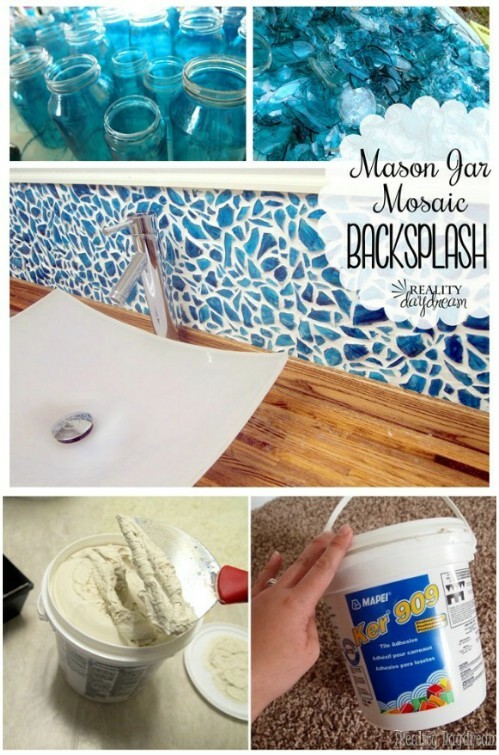 Doing mosaics over mason jars is really easy and you can create any number of beach worthy looks from seashells and other coastal colored tiles and stones. I love the thought of tying a seashell to the top with twine or burlap and then adding tealights to give your patio a beautiful beach like glow. 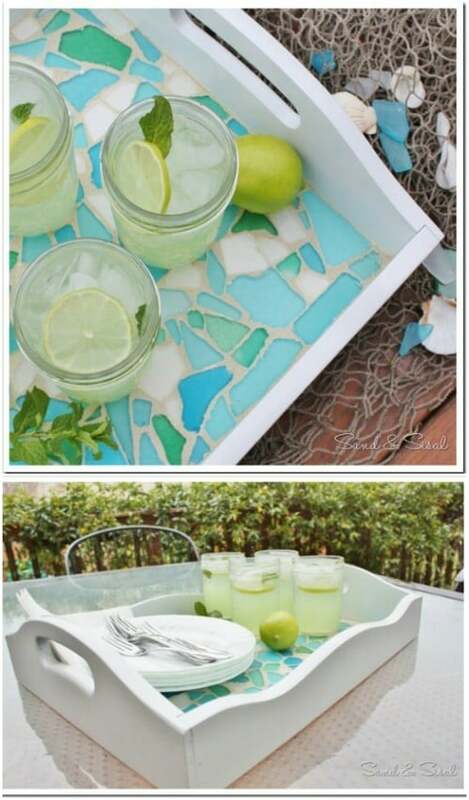 You can also create a beautiful serving tray that is perfect for giving your patio a coastal feel. You use beautiful sea glass to create the look or you could do it with similarly colored tiles or glass if you aren’t’ close enough to the beach to get actual sea glass. This is a gorgeous serving tray that is perfect for carrying lemonade and other cool drinks out to the patio on hot summer days. Whether you want a table for your patio or something unique for indoors, this sea glass mosaic tabletop is perfect. You make it over an existing table and it’s the perfect way to show off your creativity. 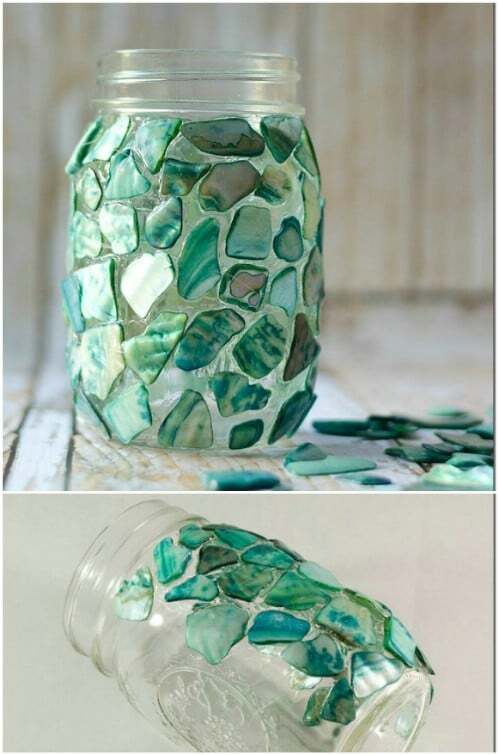 Use sea glass if you have it or if you don’t, you could also do this with other glass, tiles or stones. 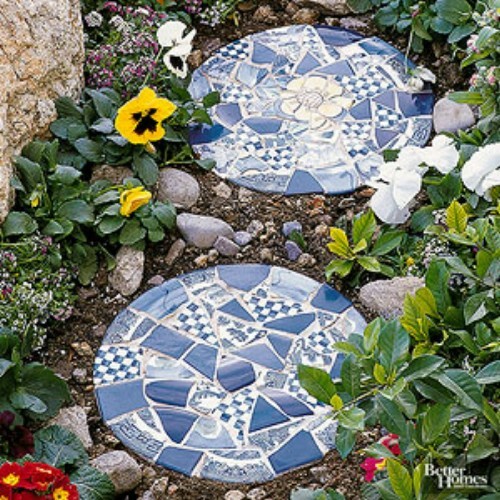 Turn your walkway into a thing of art when you add mosaics to your stepping stones. 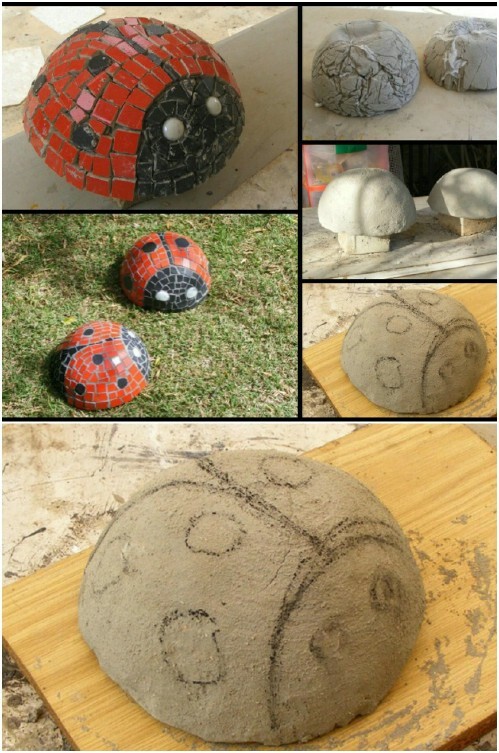 Whether you buy garden stones from a home improvement store or make your own from concrete, this is a wonderful way to give them a bit of decoration. You can be as creative as you like and use all sorts of things from glass stones to broken china to create the look. Here’s another beautiful serving tray that you can update with mosaics. If you don’t have a serving tray to use, these things are really cheap at yard sales and thrift stores. These geometric shaped glass stones are perfect for creating a very elegant look and this is really easy to put together. You can find tiles in different shapes at any home improvement store and a nice coat of epoxy holds it all together. Turn those tiles or broken glass into a beautiful succulent planter. 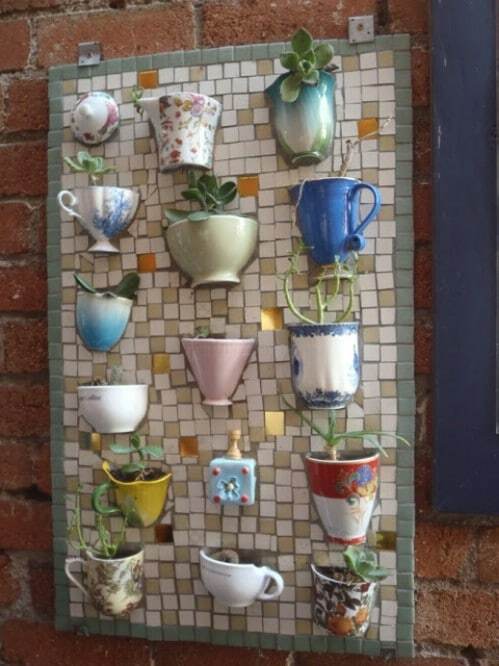 The plants are housed in broken teacups or coffee mugs and you can use similar items to create the mosaic effect. This one is a bit time consuming and may take you a couple of days to complete. Once it’s finished though, it is a beautiful way to display those succulents on your porch or in the house. Transform an ordinary and inexpensive vase into something that looks like you bought it on Fifth Avenue. I love the use of mosaics to turn ordinary things into spectacular creations. 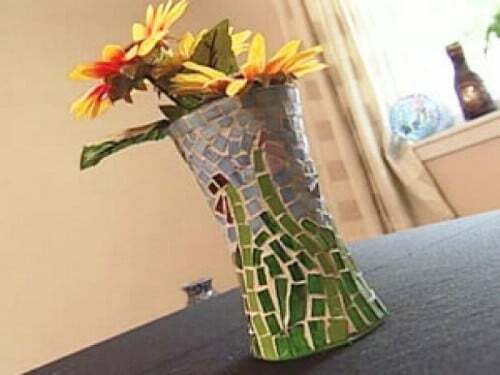 You can pick up a vase at the Dollar Store for around a dollar and using mosaics, turn it into something that others pay a small fortune for in high end stores. Note that you will want this to dry for 24 hours and then seal it with a wet seal to keep water drips from ruining your mosaic design. 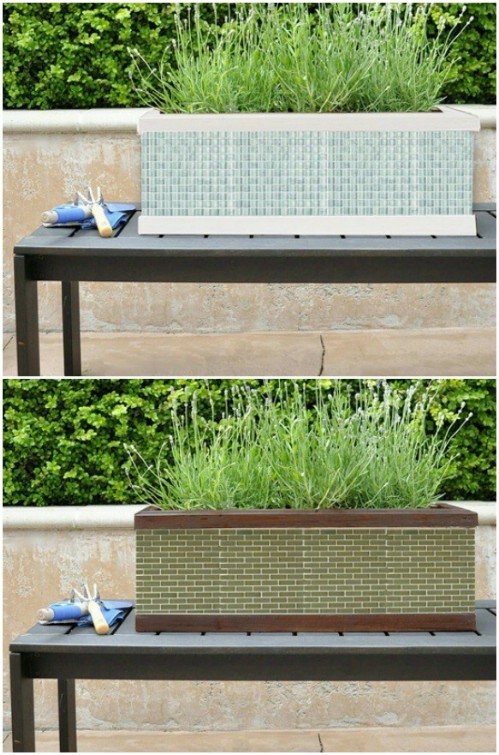 Turn an ordinary window box planter into a beautiful display when you add mosaic tiles. 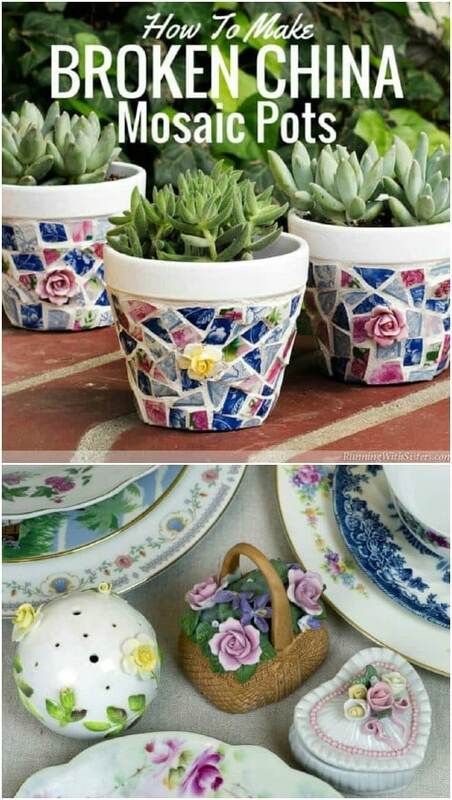 You could even build your own planter and then decorate it with these tiles or you could just as easily use broken china or other glass to get the look that you want. This is a relatively easy project and one that will instantly improve your curb appeal and give your flowers a beautiful new home at the same time. 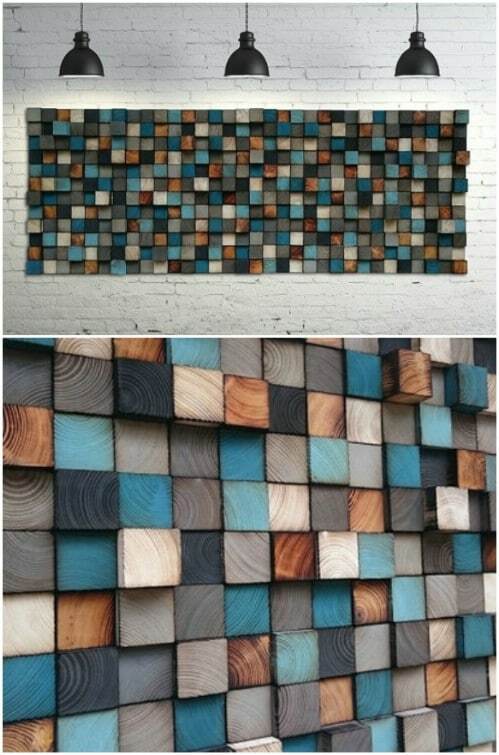 If you really want to show off your mosaics, why not turn them into an amazing headboard. I found this one on Etsy and it fits a queen sized bed. You can buy this one for around $400 or recreate the look yourself if you prefer. It will take a bit of time to line those tiles up and how many you need will depend on the size of your bed. Whether you make it or buy it, this is a beautiful wall display that is sure to brighten up the bedroom.